An early glimpse at Android Q is revealing — but if you really want to grasp Google's Android plans for 2019, you have to look beyond the surface of the recent leak. While that query may remained unanswered for now, we do have a few fascinating clues about Q to chew over this January. They come to us by way of an apparent early development build of the software that landed in the hands of enthusiast website XDA Developers last week — and they give us our first detailed glimpse at what Google appears to be working on with this next-gen Android update. Some of it is stuff we've been expecting for a while now, like a system-wide dark mode that brings a less glary and battery-draining option not only to the core system interface but also to individual apps on a device. (Hints of such plans had been popping up for months and were more or less confirmed in a since-deleted posting by a Googler earlier this year.) Beyond that, Q appears to contain an expanded and revamped permissions system for apps and a cryptic new "desktop mode" within the operating system's developer settings. All of these revelations have led to countless conclusions about what Android Q is all about and where Google is going with the software. But in reality, there's almost certainly more to the story. As we think ahead to Q and the other Android trends shaping up for 2019, I thought it'd be worth stepping back for a second and considering a few bits of important context. After all, with leaks in particular, context is everything — and it's also precisely what tends to be lacking in early assessments of information. Perhaps the most intriguing and speculation-creating part of the Android Q leak is that aforementioned "desktop mode" — something that XDA unearthed in the software's developer options alongside a description that tells us just enough to be tantalizing: "Force experimental desktop mode on secondary displays." On the surface, it sure sounds like Google might be gearing up to prep Android for a two-in-one, plug-your-phone-into-a-monitor sort of setup — something along the lines of what Samsung does with its DeX mode on Galaxy devices or what Motorola and other companies have tried in the past with little success. This sounds to me like it’s going to be a Samsung DeX or EMUI Easy Projection-type feature, but I wasn’t able to actually test it since nothing happened when I plugged in my USB Type-C to HDMI adapter. Also, for some reason, I was unable to connect to Wi-Fi so I couldn’t test whether this experimental desktop mode works via the cast option. Me? I'm not so sure. First of all, these sorts of setups — including Samsung's — have never really taken off in any meaningful way or managed to provide a truly worthwhile experience that rivals what you can get from a regular laptop (something most business-minded folk already carry without issue these days). And second, Google's made a tremendous investment as of late to position Chrome OS as its Android-complementing desktop platform, taking on the role of both tablet and laptop within the ever-expanding Google ecosystem. Starting to offer an Android-based desktop mode now would be quite a convoluting shift — not something I'd put completely out of the realm of possibility, mind you (given that, y'know, this is Google we're talking about), but something that'd certainly seem like an extraordinarily strange pivot at this point. So what could this "desktop mode" be all about, then? As the bright and beautiful bipeds who read my newsletter know, I can't help but wonder if the more realistic possibility is that it's a feature being tested to work on future phones with secondary displays — all those funky foldable handsets and other devices with quirky extra panels that we're expecting to see soon. It all comes down to your interpretation of those last two words. Only time will tell, but for now, it's worth remembering that getting your brain too committed to an early surface-level conclusion can sometimes send you down a misleading path. There's no question: The changes to app-oriented permissions in this Android Q leak are pretty darn intriguing. In short, Q appears to break down app permissions a nudge further than what we see in the current Pie release, with settings that are easier to understand and even more granular to manage. Instead of having to flat-out approve or deny an app access to something like your location, for instance, you could authorize it to access that permission only while it's actively in use — meaning it wouldn't be able to get to that info in the background and monitor your whereabouts anytime, as the current model allows. That's a pretty monumental leap forward for privacy, to say the least — and like so many Google themes before, it looks like it won't be limited strictly to Android Q itself. Consider, as my newsletter compatriots and I also discussed on Friday, the separate and seemingly unrelated story that Google is rethinking its approach to Android's SMS and call log permissions: In an announcement aimed at developers last week, El Goog declared that it would no longer allow just any app (cough, cough, Facebook) to obtain access to those sensitive and easily abused areas; instead, a developer will now have to apply and get explicit permission from Google before it can even ask you to grant it such a privilege. 2019 will see big safety improvements related to sensitive permissions usage in apps. Balancing safety and utility is hard, and Google's investment to do this well for developers is huge. Now, let's be clear: Kleidermacher most certainly did not make any explicit reference to Android Q in his comments. But he did pretty clearly hint that what he was discussing that day — the OS-independent change in Google's stance on SMS and call log permissions — was but the tip of the iceberg when it comes to the company's plans for "big safety improvements related to sensitive permission usage in apps" this year. An interesting coincidence, wouldn't ya say? This wouldn't be the first time Google has bundled improvements in an Android OS update with broader efforts in the same domain — especially when it comes to security. It's a good reminder that Google's themes are often far less isolated and product-specific than they may seem at first glance, and it's important for us to zoom out as much as possible and think about how such progressions could be part of a broader pattern that stretches beyond just a single operating system update. Last but not least, the requisite reality check: It's all too easy to look at something like this early Android Q build and think: "Huh. So that's it?" 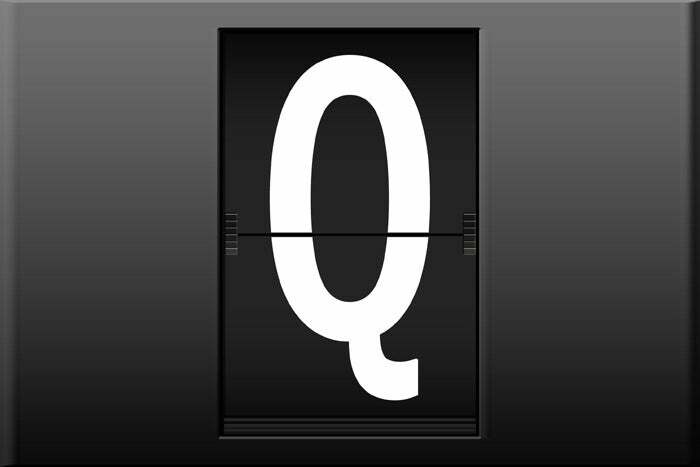 But — here it comes — it's worth bearing in mind that it's way too early to reach any conclusions about what Q could actually entail. Why? Simple: This is, by all counts, a very early development build of the software — not even the first public developer preview. It's not only possible but also quite probable that what we're seeing in this setup is a far cry from the complete Android Q picture. Even by the time we reach the point of that first public preview, Android software is typically anything but finished. Think back to the first Android P preview, for perspective: Aside from being rough around the edges and not yet ready for prime time, that software lacked what would become one of P's most significant elements: the gesture navigation system that'd redefine the standard for getting around an Android phone — the first such change since the removal of the permanent Menu button way back in the Honeycomb and Ice Cream Sandwich era. That new gesture nav system didn't show up until P's first beta release last May — about two months into the preview process. And its initial incarnation was pretty different from the final version that appeared later down the road. Other P features, like Digital Wellbeing and Slices, were also out of sight in those early days (and Slices is still more or less M.I.A., for that matter, but that's another story altogether). The same thing has happened before, where noteworthy features haven't appeared until late in the development process (paging Google Now on Tap...) and elements of a release have evolved considerably from their first sighting to their final form. So, yeah: Judging much of anything from a pre-preview software build is just wildly premature. Heck, judging much of anything from an early official preview build is still pretty darn questionable. If you look at this leak as much more than an intriguing peek, in other words — a glance at some of the early concepts Google appears to be working on for this year's Android Q release — you're getting ahead of yourself and giving this more weight than it probably deserves. Perspective is critical when it comes to interpreting this sort of information. The good news, though, is that it shouldn't be long before we get more firm info to feed our knowledge-thirsty noggins. Google gave us our first official glimpse of Android P on March 7th last year, and the launch date for Android previews has been inching earlier and earlier with every year as of late. So odds are, we'll know at least a little more about Q before long. Until then, take interpretations with a grain of salt, consider those broader narratives, and keep things in perspective — and, of course, eat hearty helpings of Quetschentaart whenever the opportunity arises. Hey, you've gotta get yourself ready in any way you can.